Ed Bronsdon joined the Outdoors for All Foundation as executive director in 1995. Prior to that, he served as associate executive director with Community Enterprises of Issaquah (now called “AtWork!”), a nonprofit organization that offers vocational services for individuals with disabilities. 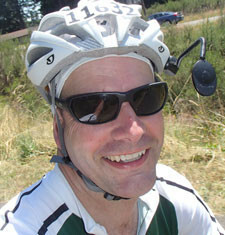 Ed grew up in Issaquah and is married to Monica; they live in Seattle with their two sons: Conor and Dan. Ed volunteers with the University Sunrise Rotary Club of Seattle and has been a Rotarian since 1987. He has served in a variety of community leadership roles through Rotary and various school groups. In 1995-96 Ed served as president of the Rotary Club of Issaquah. Ed is a graduate of the University of Washington – Jackson School of International Studies, has a certificate in Rehabilitation Facilities Management from Seattle University and holds Level III certification with the Professional Ski Instructors of America.